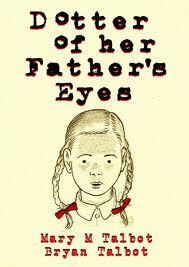 Bryan Talbot’s name has been difficult to avoid recently since he won the Costa Prize for Biography with Dotter of Her Father’s Eyes (co-written with Mary Talbot). That would be achievement enough, but he also found time in 2012 to release the third volume in his wonderful Grandville series, Grandville Bete Noire. The Grandville books have become a Christmas treat for me, replacing those annuals of long ago, and this latest album was the first present I reached for once the unwrapping was over. 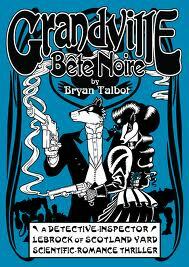 With each volume Talbot succeeds in adding depth to the world of Grandville and the character of Detective Inspector LeBrock. For those new to the series, Grandville is an alternate Earth where animals are in charge. LeBrock is a badger, for example, and a whole menagerie of animals is featured in every episode. Talbot has particular fun with the villains in this case, a cabal of evil capitalists headed by a toad, but including a vulture and a couple of fat cats. The genre is steampunk which makes some aspects of Grandville seem old fashioned while others are technologically advanced. Humans do exist but are seen as a lower form of life; that they are beginning to protest might hint at plot-lines to come. Everything is rendered in a style that is not in the least cartoony and one of the most wonderful things about Grandville is that it’s difficult to imagine it working in any other form. The book works as both an adventure and a satire, and in an illuminating afterword Talbot demonstrates its connection to historical events – in particular the link between art and politics. Ultimately Talbot uses his medium to present something that is both thoughtful and highly entertaining – and you can’t ask for much more for Christmas than that. As well as recently relaunching their entire line of comics, DC have also separately begun publishing a series of graphic novels under the Earth One banner, of which this is the second (the first was, of course, Superman by J. Michael Straczynski and Shane Davis, with a second volume due in November). The idea (as I understand it) is to present these heroes in a more realistic setting; in fact, it simply gives writers another chance to play around with their origin stories, something that has been going on for quite some time – see, for example Frank Miller’s Batman: Year One story, or the many Elseworld volumes. This, then, is the comic equivalent of a writer using a Greek myth or a Bible story as their starting point: half the fun is in knowing the original narrative. This isn’t to say it doesn’t tell a good story, but most of my enjoyment certainly came from seeing how Jones had incorporated already existing characters into his vision of Batman and Gotham. As this is what I’m mostly going to discuss you may not want to read any further if you haven’t already read the book (and intend to). Suffice to say that if you are interested in the character, you will want to get your hands on this. It seems to me a much more successful reinvention than Superman: Earth One, but then I’ve always preferred the dystopian Batman to the utopian Superman. We first met Batman in the early days of his career. His costume, and the failure of his equipment, (there’s a wonderful full-page panel of him landing on a pile of bin-bags) immediately indicates a more realistic version of the character. After this initial introduction we are given the latest presentation of his parents’ death, the event that will motivate him to fight crime. His father is still incredibly wealthy, but now has a political dimension, standing for Mayor of Gotham. 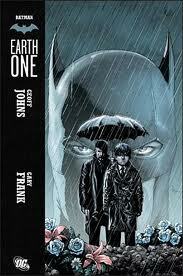 Jones also slightly alters the murder scene, making Bruce more culpable for leading his parents to their killer. The most striking change is in the character of Alfred who becomes an army buddy of Bruce’s father who is (rather implausibly since he turns up on the night they are killed with no sense they are in regular contact) named as Bruce’s guardian. When struggling to come up with an answer to Bruce’s, “Who the hell are you?” he decides on, “I’m your butler”! A number of other well-known characters also appear. Oswald Cobblepot (better known as the Penguin) is Mayor of Gotham – and apparently has been for some time as he was Bruce’s father’s rival. James Gordon and his daughter Barbara, Harvey Bullock, and Harvey Dent all put in appearances, but there is also a new villain to be dealt with. 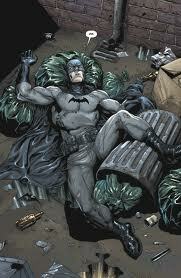 Gary Frank’s art is excellent, perfectly suited to the realistic look of the book. There are plenty of hints at a sequel – Barbara Gordon drawing a Batwoman costume and a final panel with a silhouetted figure commenting, “What a riddle.” I, for one, am certainly looking forward to it. When Roy Thomas left Marvel comics for DC in 1981 he had many years of writing successful comic series behind him, perhaps most notably The Avengers and Conan. No surprise, then, that his first new series at DC were the Conan-like Arak, Son of Thunder and a superhero team book – All Star Squadron. 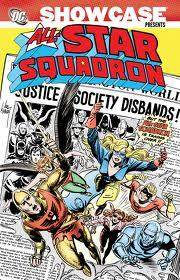 All Star Squadron, however, had more in common with another team book Thomas had written at Marvel, The Invaders, as both are set during World War Two. 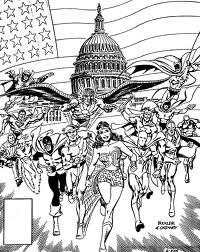 All Star Squadron not only allowed Thomas to write about the Justice Society of America (the original superhero team) but many other silver age characters that had long been forgotten. (We can see this slightly obsessive tendency in the way that comics from the 1940s are footnoted throughout the series). If you’re prepared to put logic to one side, however, this series is great fun – largely because you sense Thomas is having fun. He puts together a cast of forgotten heroes – The Shining Knight, Robotman, Johnny Quick, Liberty Belle, Hawkgirl (and rebrands Firebrand to balance the sexes) – and makes them all individuals, just as he did with The Avengers. Hawkman and The Atom from the Justice Society also make frequent appearances, and Steel joins the group in issue 8. Mix in some history (Pearl Harbour, Winston Churchill) and some pulp villains (largely Nazis and mad scientists) and you’ve got all you need for light-hearted adventure. The art on the first five issues is by the excellent Rich Buckler, who is then replaced by Adrian Gonzales, an artist I could not recall at all despite having bought the original comics. He drew very few superhero comics – I think only this and a some issues of World’s Finest – but is perfectly efficient beneath the inks of Jerry Ordway, who to a large extent gave the book its look and (I think) went on to pencil it himself later. The first Showcase volume prints issues 1 -18 and the first Annual – all in black and white, of course, on cheap paper. (But comics at that time were printed on cheap paper and the colour wasn’t up to much either). the only disappointment is that it only includes the All Star Squadron issues of a team-up with The Justice League thereby not only missing out three episodes but the conclusion of the story. Marvel are much better at including these extra issues: this sometimes means an issue is reprinted twice but that’s preferable to not having it at all. That said, while far from being a classic, this remains one of my favourite comics. The first time I came across Bryan Talbot’s work was when early episodes of The Adventures of Luther Arkwright were published in the Edinburgh magazine Near Myths (which also featured a strip written and drawn by a young Grant Morrison). This (and its sequel) was only completed after many years while he also worked for 2000AD in the UK and DC Comics in America. Recently he has concentrated on graphic novels, and it would be no exaggeration to say he has become one of Britain’s most important creators in this medium, particularly with his wonderful Grandville series, with two volumes already published and another underway. His latest work is therefore not a departure from the fantasy world of Grandville, but it is certainly a detour, being a collaboration with his wife Mary and so rooted in reality as to fall under non-fiction. Lucia’s story is rendered in black and white (with a blue wash) making clear it predates Mary’s by suggesting old photographs found in a trunk in the attic – indeed her first appearance gives every indication of having been copied from a photograph. In both cases adolescent rebellion can be seen to fail. Lucia’s attempts to create a career for herself are frustrated by her parent’s insistence that she move to London with them, and she never recovers from the end of her relationship with Samuel Beckett and the discovery that her parents are not married. Mary’s rebellion, if it is one, is almost diametrically opposed: she defies her father’s expectations that she will go to Cambridge and instead falls pregnant and marries: however, she is now a prominent academic. Thematically, though, the links between the two stories are fairly weak. Though book-ended with the quotation form Finnegans Wake, “My cold mad feary father,” Joyce does not come across as fearsome at all (though Nora would certainly scare me), and both fathers are rather slightly portrayed: very much as observed from the outside. 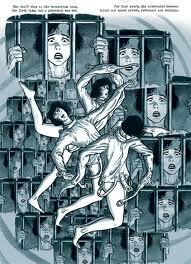 Both Mary and Lucia’s stories are interesting, but for every scene where the graphic format allows a lot of information to be delivered swiftly (the picture of Mary and Bryan talking with all their shared interest illustrated above them) or dramatically (Lucia being committed to an asylum depicted as dance moves in a strait jacket – see below), there are others where you wish the depth of a biography were available. However, it is a fascinating exploration of the comic medium as a form for documenting lives and highly recommended to anyone interested in the development of the graphic novel. For anyone who wants to catch up quickly and cheaply on the history of American comics, there can hardly be a better way to do it than DC’s Showcase and Marvel’s Essential series. Over 500 pages of comic for a little over a tenner is not only a bargain, but allows for the reprinting of entire runs of a title rather than a few select issues. (Okay, so it’s black and white, but colour wasn’t up to much in the seventies, and the cheap paper is a nostalgic reminder of the originals). Of course, some comics benefit more from this format than others, and Mike Grell’s The Warlord is the perfect example of this: for a number of years it has been in my top three hoped-for reprints (the others being All Star Squadron, out later this year, and Master of Kung Fu). 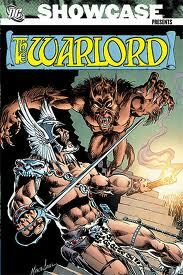 The Warlord is ideal for Showcase as it’s written and drawn entirely by Grell (with Vince Colletta providing inks from issue 16) and it’s entirely self-contained: no background knowledge is needed of the character or the DC universe. It’s also great fun. The Warlord is Travis Morgan, an air force pilot (as Grell was) who, when his plane crashes, finds himself in a strange underground land known as Skartaris. Within a few pages he has wrestled a dinosaur, fallen in love with a warrior princess, and made a mortal enemy of the high priest Deimos. In fact, what is most astonishing about the series now is the pace with which it moves. Whereas today comics writers tend to take one idea and stretch it over many issues (often of more than one title), Grell seems to come up with a new idea every few panels. The fact that Skartaris is entirely imaginary is in his favour: it does, at times, feel as if literally anything could happen. By the end of the first issue proper (The Warlord was first introduced in 1st Issue Special #8, also reprinted here) he has been captured by slavers; in issue 2 he is a gladiator who is soon leading a gladiator army in rebellion; in issue 3 he is attacked by lizard men and we get the first hint of science fiction undertones as the final panel reveals a very modern control room in a ruined city. Issue 6 sees him return briefly to earth; returning to Skartaris only a few days later he discovers he has been gone for far longer. Grell is clearly having fun plundering his favourite writers (Edgar Rice Burroughs, Jules Verne, H. G. Wells) to create something entirely new. He even manages a story with aliens. Of course, it doesn’t always make sense. He tells his Russian travelling companion, Mariah Romanova (picked up when he briefly surfaced to allow some Cold War banter), to melt her rifle down for the steel as “your ammo is almost gone and there aren’t any sporting goods stores round here,” but his pistol is still firing away twenty issues later. (Female readers may also object to the fact that when she is asked to wear something less conspicuous than her earth clothes she opts simply for something less that looks to be mostly made out of ink.) However, you don’t read sword ‘n’ sorcery for its impeccable logic – what sensible man would walk around in a loin cloth in a land of perpetual sunlight? The stories are driven along by Grell’s love of the genre and the increasing dynamism of his art, with figures forever bursting out of panels, where the pages contain panels at all. An enjoyable reminder of the less serious seventies for those with a tolerance for muscled men wielding swords at improbable angles. And with The Warlord lasting for 133 issues, with Grell writing and drawing the first 52, there’s plenty of opportunity for a second volume. You are currently browsing the archives for the Comics category.